Sometimes our battles are not all our own. Each day, a new and fresh opportunity arises – giving us the chance to share our struggles with another traveler. In this exchange we shift the heavy burden, we find new strength, and discover that somehow two individuals working together are stronger than the sum of their parts. Gil is a gifted construction worker in the battle of his life. 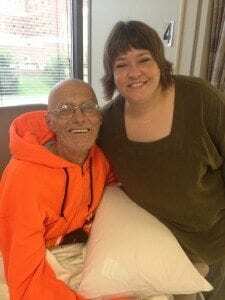 His brain cancer has spread to his spinal cord and lungs. He struggles to find the strength to keep from falling. At one time, Gil used his talents to build the outpatient chemotherapy unit. Now he spends hours there battling his malignancy head on. But at CoxHealth, Gil’s battle is not all his own. The hands of 2,500+ Good Samaritans are here and reaching out to share some of the load. The faithful gifts of CoxHealth employees provide support through funds like Hannah’s Hope, designated for brain cancer patients like Gil. As a result, CoxHealth Foundation is shifting some of his burden and carrying some of the financial load created by his medication and treatments. Now Gil is not alone and the story of the Good Samaritan has come to life. CoxHealth’s Good Samaritans are stepping up to help Gil and others continue to fight. It is only through the gifts of our employees that the Good Samaritan Program can help patients like Gil. Click here and find out how you can become part of the 2,500+ employees that are extending a hand to those in need.